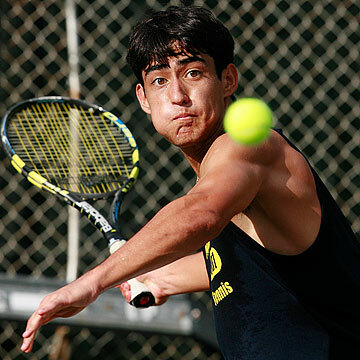 Standing just outside Punahou's tennis complex moments before practice, Skyler Tateishi clearly recalls when he was among the flock of kids scurrying around the courts as part of the school's afterschool tennis program. "I was playing in these programs," Tateishi said. "The coaches were great, I got to hit against the varsity players as a seventh- and eighth-grader, so that helped me and inspired me." Tateishi, now a senior captain for the Buffanblu varsity team, may be the one the youngsters look up to these days. He placed third at the state championships last year while helping Punahou add another team title to a bulging trophy case, and earned some national acclaim this year by going 6-2 at the USTA National Open Championships in February at Central Oahu Regional Park. Tateishi, who signed with Washington in the fall, was second on last month's tennisrecruiting.net Hot 100, listing the nation's fastest-rising high school players. On the same Web site's senior boys national rankings, he jumped from No. 206 to 96 in February with his performance against the other ranked opponents in the annual USTA tournament hosted by the Punahou Tennis Club. This week, he made it up to 91st. "At this point my ranking doesn't really matter as much as just becoming better to play college tennis," Tateishi said. "I was really just happy I got to play a lot of matches there and play against some really good players. "I think I did a little better than I expected to do. ... I just kind of just played with the intention of just practicing and trying my best, and I ended up getting lucky in a few." Tateishi has since turned his attention back to the high school season with a Punahou boys team that has dominated Hawaii high school tennis for decades, fed partly by the school's afterschool program that aided Tateishi's development. The Buffanblu have won 38 of the 49 state championships awarded since 1958. Their current championship streak stands at 16, part of a run of 23 titles in 24 years interrupted only by Lahainaluna's 1990 crown. "We definitely want to try hard to uphold the tradition that we have here, but we just have to play one point at a time," Tateishi said. "We're training our hardest that we can, but the other teams are trying just as hard to beat us. We'll do our best and see what happens." An individual state championship has eluded Tateishi so far. He won the Interscholastic League of Honolulu championship last spring and was the top seed entering the Carlsmith Ball/HHSAA championships. But he dropped a 7-6 (3), 7-5 semifinal decision to teammate Mikey Lim, who went on to repeat as state champion. With Lim now a freshman at Claremont McKenna, Tateishi hopes his turn at the top will arrive when the state tournament on Maui rolls around in early May. "That's what I'm hoping, but you never can tell, there's so many good players at states and the draw is so big," he said. "I'm training my best and practicing hard trying to do that, but it's going to be tough." Though becoming the 15th Punahou player to win an individual crown remains a goal, Punahou coach Rusty Komori said that quest hasn't clouded Tateishi's focus on the team and praised his relentless work ethic. "A lot of people, when they're good, think, 'me, me, me,' " said Komori, who is in his 14th year with the Buffanblu. "He's more concerned with his teammates than himself. "Just to see him develop into the guy he is is just tremendous. ... He's just very respectful of his peers and everyone around him. There's something special about him." Following graduation, Tateishi's college career will take him back to his birthplace. His family moved from Seattle to Kailua when he was 5 and he started hitting balls with his father a couple of years later. He progressed to tournament play when he was 9 and has spent his summers playing in mainland tournaments since he was 11. It was at a tournament in Kalamazoo, Mich., last summer that Tateishi met Washington coach Matt Anger, who offered him a spot on the Huskies roster over lunch. "In Hawaii, you play the same people over and over," he said. "On the mainland there's so many different players and there are different varieties of players. I learned so much going up there. The results, it's usually hard, I don't do too well, but I learn a lot and I have fun every time I go." 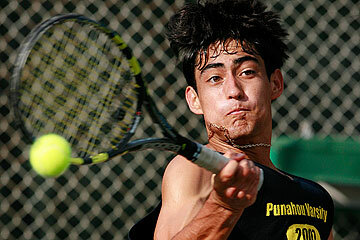 While Tateishi's ranking puts him in the spotlight, Punahou's depth remains a strength. Alex Ching, one of the state's top junior golfers, won the state doubles title last year and is partnered with Erik Shoji, a volleyball standout who was part of the second-place team at states. Kevin Caulfield reached the state semifinals as a freshman last year and lost to Tateishi in the third-place match.